At Tata Communications, we believe there is a better way to do things. We understand that while some people move up in the world, others take the world further. In our thoughts and actions we continuously ensure that we are Ambitious, Collaborative and Transformative. This focus is animated by five basic principles; encapsulated in a one-word philosophy – DRIVE. Daring is to challenge the status quo, taking risks and creating new paradigms. It is extremely important for us to be daring as a team. To be innovative and think differently together while at the same time looking out for each other. Responsive is all about the context. To make the right decisions as an organisation, we must look at the bigger picture and be quick and agile when responding to customers. It is also about being available to your team and the wider organisation, as collaboration is key. Inclusivity lies as the bedrock of the our culture. We fundamentally believe that our success as a company depends on mutual respect and support – the strengths that underpin true diversity and inclusion. Diversity is something that we will not just tolerate, but something which we will seek out and harmonise to improve the coherent strength of the business as we strive to create an inclusive culture for all. Venturing comes from a deep sense of curiosity and passion for learning. Moving out of your comfort zone and creating new opportunities for not only you but also your team. Our employees are encouraged to look at all situations from different perspectives and motivate others to do the same, therefore creating a new world of opportunity for themselves and Tata Communications. Ethical stands as the foundation of the company. As part of the Tata Group, we believe in ‘Leadership with Trust’. It’s about acting with integrity and honesty in the workplace and outside. As the root that holds our organisation together, Ethics is what feeds the rest of our culture. At Tata Communications, we practice each attribute every day as individuals and together improve each other as a team. As an organisation, we are dedicated to identifying and nurturing collaboration in our culture, across regions, practices and skillsets. With the right attitude, we WILL deliver a new world of communications. Our culture and thinking helps our customers become agile enough to take advantage of opportunities for growth. Our global offices house 8500 talented employees representing 40 nationalities across the world, and our vast pool of expertise in the communications and technology sectors embody our commitment to conduct ethical and sustainable business. The UK is one of the first countries to introduce government-mandated gender pay gap reporting, requiring all companies with 250+ employees to publish their gender pay gap. Gender pay gap figures show the difference between the average earnings of men and women in an organisation. It is not the same as equal pay, which refers to men and women who carry out similar jobs being paid the same. 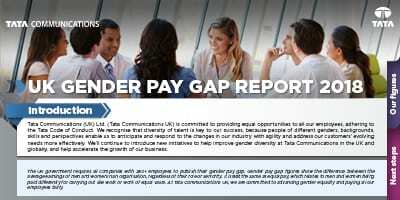 Tata Communications (UK) Ltd. (Tata Communications UK) is committed to advancing gender equality and paying all its employees fairly. We’re proud to have been included in AON’s Best Employers India 2018 – our third year in a row! Tata Communications is committed to creating a culture of openness, curiosity and learning. This recognition from AON as a Best Employer for the third year is testament to our organisational approach to people. We firmly believe that investing in talent and listening and responding to their needs creates skilled, engaged and collaborative employees who are driven to go the extra mile. As a digital infrastructure provider, we’re tuned in to the rapidly changing technology landscape and understand the importance of acquiring new skills and capabilities. Leveraging futuristic thinking and new technologies like AI, Machine Learning and Big Data, we have transformed our People Strategy to ensure our employees are future-ready and geared for success. We’re thrilled to receive this recognition from AON. Read our 2018 UK Gender Pay Report here. Read our 2017 UK Gender Pay Gap Report here.